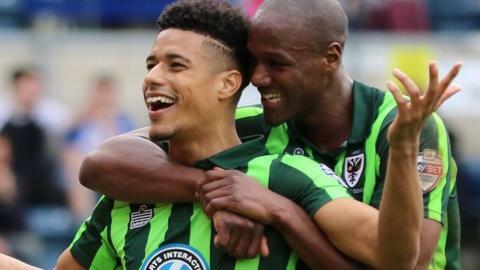 Lyle Taylor's brace helped AFC Wimbledon to a win over fellow League Two play-off hopefuls Wycombe. Taylor opened the scoring with a right-footed effort from eight yards out, as the Dons quickly took control. The Chairboys drew level when Michael Harriman rifled an effort into the bottom corner from the edge of the box. Taylor netted a deserved winner from the penalty spot after Aaron Pierre's foul on Rhys Murphy, tucking his effort into the bottom-left corner. Defeat leaves Wycombe seventh, following a run of just one win in five matches. Wimbledon move up to ninth place and are now just two points behind the Chairboys. "I thought we were by far the better team. They've had one shot on goal, through legs, that's gone in, their only real shot, and we had seven, eight clear-cut (chances), we've hit the bar twice. "It should have been more comfortable, but in the end we've seen our jobs out really well and we've done enough to win the game. "We went brave, we played with three up - we worked on it during the week, the boys executed it brilliantly and those three were a handful for anyone. "I think the ref gave them some helping hands; kept giving them as many free-kicks as they could handle, but we defended them." Match ends, Wycombe Wanderers 1, AFC Wimbledon 2. Second Half ends, Wycombe Wanderers 1, AFC Wimbledon 2. Attempt saved. Jerell Sellars (Wycombe Wanderers) left footed shot from very close range is saved in the centre of the goal. Jonathan Meades (AFC Wimbledon) is shown the yellow card for hand ball. Hand ball by Jonathan Meades (AFC Wimbledon). Attempt missed. George Francomb (AFC Wimbledon) right footed shot from the centre of the box is just a bit too high. George Francomb (AFC Wimbledon) is shown the yellow card for a bad foul. Foul by George Francomb (AFC Wimbledon). Attempt missed. Aaron Pierre (Wycombe Wanderers) header from the centre of the box is just a bit too high. Corner, Wycombe Wanderers. Conceded by Jake Reeves. Foul by Adebayo Azeez (AFC Wimbledon). Michael Harriman (Wycombe Wanderers) is shown the yellow card for hand ball. Hand ball by Michael Harriman (Wycombe Wanderers). Attempt missed. Stephen McGinn (Wycombe Wanderers) right footed shot from outside the box is close, but misses to the left. Sido Jombati (Wycombe Wanderers) wins a free kick on the left wing. Substitution, AFC Wimbledon. Sean Rigg replaces Rhys Murphy. Substitution, Wycombe Wanderers. Rowan Liburd replaces Garry Thompson. Aaron Pierre (Wycombe Wanderers) wins a free kick in the attacking half. Substitution, Wycombe Wanderers. Sido Jombati replaces Joe Jacobson. Adebayo Azeez (AFC Wimbledon) is shown the yellow card. Foul by Rhys Murphy (AFC Wimbledon). Substitution, AFC Wimbledon. Adebayo Azeez replaces Lyle Taylor. Substitution, Wycombe Wanderers. Ryan Sellers replaces Paul Hayes. Delay in match Jason McCarthy (Wycombe Wanderers) because of an injury. Jason McCarthy (Wycombe Wanderers) wins a free kick on the left wing. Foul by Lyle Taylor (AFC Wimbledon). Dannie Bulman (AFC Wimbledon) is shown the yellow card for a bad foul. Matt Bloomfield (Wycombe Wanderers) wins a free kick in the attacking half. Foul by Dannie Bulman (AFC Wimbledon). Delay in match Tom Elliott (AFC Wimbledon) because of an injury. Attempt missed. Rhys Murphy (AFC Wimbledon) header from the centre of the box is just a bit too high. Corner, AFC Wimbledon. Conceded by Joe Jacobson.